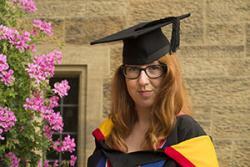 A budding writer and director graduated this week at Bangor University after an amazing three years. A former pupil at Wiesbaden American High School in Germany, Sarah Homerstone, 24, received a BA (hons) Creative Studies degree after studying at the School of Creative Industries and Media. Sarah is originally from London but moved to Germany when she was 12. She attended a number of different nationality schools such as a local German school, an international school, and an American high school. With all this hustle and bustle she never expected to go to university, especially in the UK where she started her education. Sarah’s mother went to a boarding school in north Wales, and the family had vacated in the region. When it came to choosing a University, Bangor seemed to be the most natural choice. Excited after receiving her degree, Sarah said: “It feels like such an unexpected and worthwhile achievement seeing as I had no intention in furthering my education. The experiences and people have meant more to me than the degree itself, although it’s been great to study my course in such a perfect place. I left an intern job in Germany, working in business management on the Commerzbank trading floor, to study at Bangor. It was a bold choice, to leave the business world behind to follow a career in the arts, but I have no regrets. “I became a member of the Bangor English Dramatics Society and wrote and directed a play, ‘The Alice Effect’, formerly called ‘One Flew into Wonderland’, which was initially created for my dissertation. My play won a place at the Welsh Finals of the One Act Drama Festival after winning the Anglesey Once Act Drama Festival earlier this year. “My play was inspired by Lewis Carroll’s ‘Alice in Wonderland’ and Ken Kesey’s ‘One Flew Over the Cuckoo’s Nest’. My version opens with Alice’s arrival at a mental health institution and takes the audience on a journey of disorientation. My play merges the characters of both novels into singular identities, as Alice meets the staff and inmates, who are confused about their perceptions of reality. “During my final year, I co-founded an acting group for the theatre department, which has enjoyed several successful performances and I also arranged a visiting lecture for fellow students from ex RSC Artistic Director and current Director for Clwyd Theatr Cymru, Terry Hands. “I also worked part-time as an administrator for the retail company, Next, during my studies. I found it to be a great additional asset as it helped me to keep focused on my education as well as keeping a foot in the work place.